The domain within your query sequence starts at position 29 and ends at position 281; the E-value for the LamNT domain shown below is 5.35e-129. 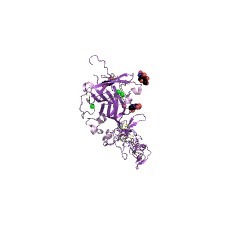 N-terminal domain of laminins and laminin-related protein such as Unc-6/ netrins. Laminin is a large molecular weight glycoprotein present only in basement membranes in almost every animal tissue. It is thought to mediate the attachment, migration and organisation of cells into tissues during embryonic development by interacting with other extracellular matrix components [(PUBMED:1975589)]. Each laminin is a heterotrimer assembled from alpha, beta and gamma chain subunits, secreted and incorporated into cell-associated extracellular matrices [(PUBMED:10842354)]. 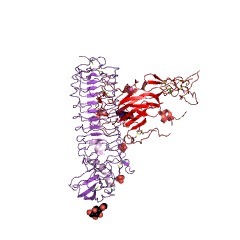 Basement membrane assembly is a cooperative process in which laminins polymerise through their N-terminal domain (LN or domain VI) and anchor to the cell surface through their G domains. Netrins may also associate with this network through heterotypic LN domain interactions [(PUBMED:8349613)]. This leads to cell signalling through integrins and dystroglycan (and possibly other receptors) recruited to the adherent laminin. 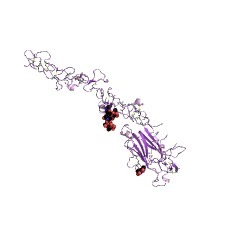 This LN domain dependent self-assembly is considered to be crucial for the integrity of basement membranes, as highlighted by genetic forms of muscular dystrophy containing the deletion of the LN module from the alpha 2 laminin chain [(PUBMED:7874173)]. 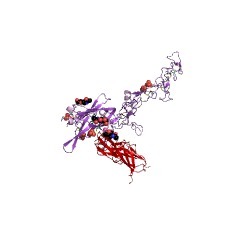 The laminin N-terminal domain is found in all laminin and netrin subunits except laminin alpha 3A, alpha 4 and gamma 2. 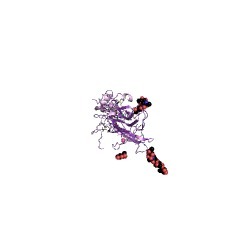 There are 8957 LamNT domains in 8947 proteins in SMART's nrdb database. Taxonomic distribution of proteins containing LamNT domain. This tree includes only several representative species. The complete taxonomic breakdown of all proteins with LamNT domain is also avaliable. Click on the protein counts, or double click on taxonomic names to display all proteins containing LamNT domain in the selected taxonomic class. Netrins evoke mixed reactions in motile cells. In the developing nervous system, migrating cells and axons are guided to their targets by cues in the extracellular environment. The netrins are a family of phylogenetically conserved guidance cues that can function as diffusible attractants and repellents for different classes of cells and axons. 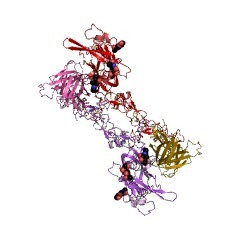 In vertebrates, insects and nematodes, members of the DCC subfamily of the immunoglobulin superfamily have been implicated as receptors that are involved in migration towards netrin sources. The mechanisms that direct migration away from netrin sources (presumed repulsions) are less well understood. 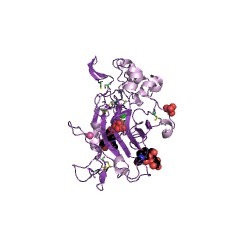 In Caenorhabditis elegans, the transmembrane protein UNC-5 (ref. 14) has been implicated in these responses, as loss of unc-5 function causes migration defects and ectopic expression of unc-5 in some neurons can redirect their axons away from a netrin source. 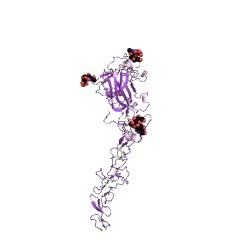 Whether UNC-5 is a netrin receptor or simply an accessory to such a receptor has not, however, been defined. We now report the identification of two vertebrate homologues of UNC-5 which, with UNC-5 and the product of the mouse rostral cerebellar malformation gene (rcm), define a new subfamily of the immunoglobulin superfamily, and whose messenger RNAs show prominent expression in various classes of differentiating neurons. 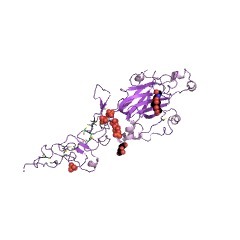 We provide evidence that these two UNC-5 homologues, as well as the rcm gene product, are netrin-binding proteins, supporting the hypothesis that UNC-5 and its relatives are netrin receptors. The netrins define a family of axon outgrowth-promoting proteins homologous to C. elegans UNC-6. In vertebrates, commissural axons pioneer a circumferential pathway to the floor plate at the ventral midline of the embryonic spinal cord. Floor plate cells secrete a diffusible factor that promotes the outgrowth of commissural axons in vitro. We have purified from embryonic chick brain two proteins, netrin-1 and netrin-2, that each possess commissural axon outgrowth-promoting activity, and we have also identified a distinct activity that potentiates their effects. Cloning of cDNAs encoding the two netrins shows that they are homologous to UNC-6, a laminin-related protein required for the circumferential migration of cells and axons in C. elegans. This homology suggests that growth cones in the vertebrate spinal cord and the nematode are responsive to similar molecular cues. 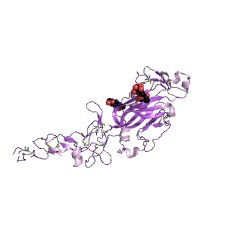 Structure of the human laminin B1 chain gene. The exon-intron structure of the human laminin B1 chain gene was determined from genomic clones that spanned 90 kilobase pairs (kb), including 80 kb of the structural gene, about 1 kb of the 5'-flanking region, and 9 kb of the 3'-flanking region. DNA sequencing and heteroduplex analyses demonstrated that the gene consists of 34 exons. The intron sizes vary from 92 base pairs to more than 15,000 base pairs. The clones did not completely contain introns 13 and 14 and, therefore, the exact size of the gene remains to be determined. The first exon encodes a 5'-untranslated region, with the ATG translation start codon being in exon 2. The promoter region does not contain TATA or CAAT boxes, but it has four GC boxes. Additionally, two GC boxes are located in the 5'-untranslated sequence. A glucocorticoid response element-like sequence and a sequence resembling the binding sequence for transcription factor AP-2 are present in the 5'-flanking region. 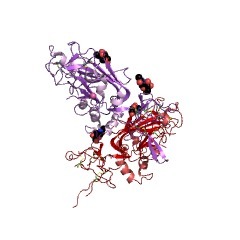 Another potential AP-2 binding sequence is located in the 5'-untranslated sequence of exon 1. 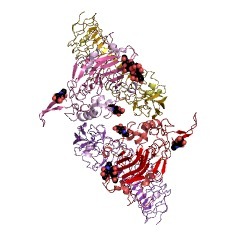 A TGACC motif present in the binding region for the retinoic acid response element of the mouse laminin B1 gene promoter is also present in the human counterpart. The overall exon pattern of the gene correlates only slightly with the highly conserved structural domains and internal repeats of the B1 polypeptide chain. 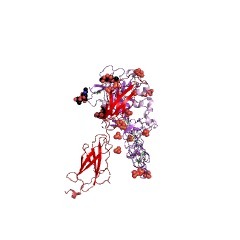 Furthermore, the exon profile differs considerably from that of the laminin B2 gene. A HincII/HpaI restriction fragment length polymorphism was identified in exon 31. SwissProt sequences and OMIM curated human diseases associated with missense mutations within the LamNT domain. This information is based on mapping of SMART genomic protein database to KEGG orthologous groups. Percentage points are related to the number of proteins with LamNT domain which could be assigned to a KEGG orthologous group, and not all proteins containing LamNT domain. Please note that proteins can be included in multiple pathways, ie. the numbers above will not always add up to 100%.